NEW to our shop…Kiddimoto balance bikes. Started in 2004 and made famous on Dragons Den in 2011, Kiddimoto have been providing quality balance bikes and scooters for little cyclists here in the Uk and abroad. 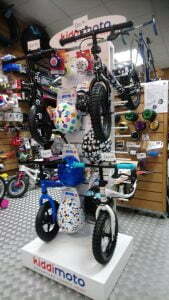 Come and see our new display of bikes and matching accessories sure to put a huge smile on any kiddies face!